This is yet one more barbarous act amongst so many. 13,500 people have already died in this conflict. At least 10,000 of them are “innocent civilians”, making this, according to the UN, “the greatest man-made humanitarian catastrophe” on the globe. Depriving a population of water and healthcare can only bring disease in its wake. A million are now said to have contracted cholera in the world’s worst epidemic in modern times. Cholera is cheap and easy to cure in normal times, but already it is reported that 2000 or so have died of the disease. Médécins Sans Frontières were forced to pull out in the middle of the epidemic due to the continued bombing campaign which has not respected hospitals, or other non-military targets. Last November Zeeshan Aleem of Vox highlighted the brutality of the war as follows. As we have seen in Syria and elsewhere modern imperialist war is total war with no holds barred. There is no Geneva Convention, or set of humanitarian concerns, that can act as a check the bestial appetites of the contending parties. The threat of later prosecution for war crimes is hardly a deterrent since only the smaller fry, or the defeated, ever get called to account. And even then it is too little and too late to offer much consolation to their victims (even if they have survived). They are the “collateral damage” of modern imperialism which is blighting the lives of people across the planet in at least 60 different conflict zones. This explains why the port of Hodeida is so critical. 70-80% of all Yemen’s imports come through there. As Yemen needs to import 90% of its staple foods from abroad it is absolutely critical that it stays open. Since 2015, Hodeida, and much of the Western coast of Yemen on the Bab al-Mandab strait, has been in Houthi hands. The strait is a narrow waterway linking the Red Sea with the Gulf of Aden, through which much of the world's oil shipments pass. As such it is strategically important for all the oil exporters of the Middle East. It is also where any aid that comes from Iran to the Houthis is smuggled in amongst the thousands of fishing boats that ply the sea there. This is why the Saudi-led coalition has made Hodeida, and the whole coastline, a major target. They want the Houthis out of there. 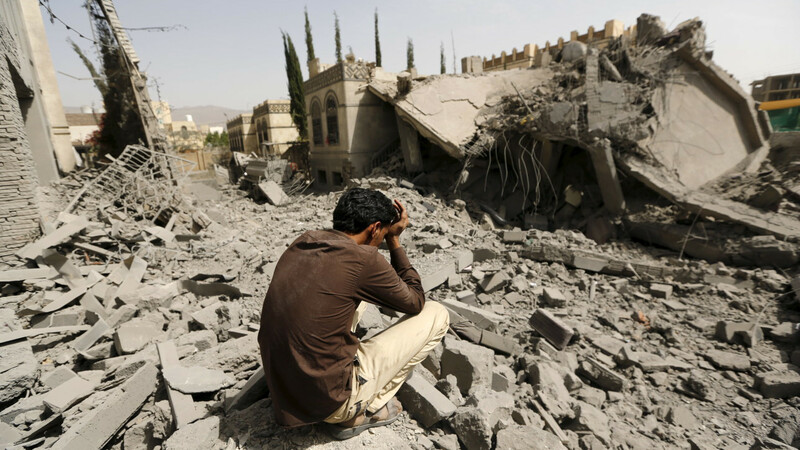 The Houthis are holding on, but most of the 600,000 inhabitants have fled. Reports say only about 150,000 remain. Most of the rest have headed for Sana’a where many families simply sleep rough on the streets. Fighting in South Yemen between the secessionists and Hadi supporters broke out in February this year. Hadi had refused to sack his Prime Minister who the secessionists accused of corruption and incompetence. This infighting was a blow to the pro-Saudi campaign which was making some progress towards the capital Sana’a. This was not due to the any particular military skill but because their enemies were also divided. There are no good guys in imperialist conflicts, and this one is no different. The Houthis had originally started their insurrection in cahoots with the former dictator, Abdullah Ali Saleh. He had previously attacked them on behalf of the Saudis on several occasions over his three decades rule. However, when Saleh was overthrown and replaced by Hadi after the Arab Spring, the Houthis found that they were not getting anything from the new regime (since Saudi Arabia was still financing the Yemeni government through the Islah Party). Saleh (who still had not revealed where stashes of arms were kept, or indeed handed over military bases to the Hadi government) now saw his chance to regain power in alliance with the Houthis. Hadi was driven from the capital Sana’a in September 2014 and, after a short stop in his power base in Aden in South Yemen, then fled to Saudi Arabia. The Saudis started preparations to attack Yemen to reinstate their man. The dirty dealings on the Houthi side did not end there. In December 2017 Saleh suddenly called upon his supporters in the General People’s Congress to fight the Houthis and support the Saudi coalition. Within 2 days the Houthis had killed him, his deputy and several bodyguards. This initially weakened the Houthis who had to deal with suspect allies, but they have now apparently re-asserted total control over the territory they occupied, and have physically ensured that there are no open shows of dissent. The Houthi, who probably did not get much help from Iran at the start of their revolt, have a long history of battle from their mountainous stronghold of Saada province. Although Shia Muslims, they belong to a different branch than that of the Iranians. There is some evidence that the Iranians initially tried to discourage the Houthi revolt. Saudi propaganda that Iran was behind it from the start has, though, now become reality. Whilst the Houthis initially relied on looting the mass of weapons already in circulation in Yemen, Iranian rockets and drones have now appeared for them to pose threats their enemies’ cities. It is not exactly clear what the Iranians hope to get from the conflict but it is a “low cost initiative”. Their chief aim now seems to be to see the Houthis plunge their regional rival into another of the world’s never-ending conflicts. After all, the Saudis have waged war against them in the past, without success. An indication of the relatively low priority of this particular massacre for the Iranians is that have not sent their own military advisors, leaving that role to their Lebanese supporters, Hezbollah. Just to add to the increasingly fragmented picture of the war in Yemen, Al Qaeda in the Arabian Peninsula are also making territorial gains in the South and East of the country. And behind the local actors creating this monument of misery there are, as ever, the major imperialist powers. The US under the Obama administration sold weapons and “provided the Saudis with air refuelling, logistics, and intelligence for their operations.”8 They also supplied precision guided munitions until December 2016 when the outcry against US collusion in the unrelenting Saudi bombing of Yemen (300 attacks a day) made the Administration hold up further supplies. These were restored when Trump took office as was full support for the bloody adventures of Crown Prince Mohammed Bin Salman.9 Even Trump though baulked at the sight of malnourished dying children as a result of the blockade and called for its end in December 2017. This the Saudis and Emiratis duly did but such a gesture was only a blip in the bigger picture. On June 12 the Wall Street Journal reported that the attack on Hodeida was being carried out with the assistance of US intelligence sharing. A US military official told the paper that “The intent is to minimize the number of civilian casualties and the harm to critical infrastructure”10 So health centres and water supplies are safe? We don’t think so. Among the NATO allies, Britain and France are the only ones who have not only maintained but increased their exports of arms to the UAE and Saudi Arabia. France is the world’s third biggest arms exporter (after the US and Russia) whilst the UK is now the fifth largest. The respective government’s of the two states argue that they are only helping the Saudi coalition to restore the legitimate government. Who is “legitimate” in Yemen is a moot point, but it is a very convenient rationale for trade deals they both desperately need. France’s Dassault and Thales have big contracts in the Gulf States but the UK is even more deeply involved in Saudi Arabia where it is a major supplier of arms and other military equipment. Half of all UK arms exports go to Saudi Arabia. In addition UK armed forces personnel are providing “targeting training” to the Saudis. It appears that either they are part of a deliberate policy of targeting civilians or they are not very good at their job. It’s not surprising that the Saudi Crown Prince got the red carpet treatment in London in March this year. A desperate declining imperialist power in the midst of an insoluble global economic crisis, and incipient trade war, needs all the revenue it can get. Winston Churchill, back in 1923, could see no harm in the RAF using poison gas on the Kurds of Mosul as they were “primitive people”, so why should our current leaders worry about their contribution to the greatest humanitarian tragedy on the planet? This also explains why there is hardly any coverage of this “forgotten war” in the UK (and apparently in most of the Western world). There are few pictures and stories coming out of the Yemen horror show because few reporters ever get in there. Sana’a has suffered an enormous amount of destruction which may, or may not, be on the scale of Aleppo, Mosul, Raqqa and all the other former great cities annihilated by the pitiless determination of imperialist powers to defend their own sordid interests. In the UK and elsewhere there are a few well-meaning people who have had both the knowledge and the principles to protest at this outrage, but they are not making much headway. They are not just faced with the complete hypocrisy of the ruling class, they are also faced with desperate states in an economic crisis determined to defend the interests of the wealthy propertied classes (known to themselves as “the country”). They do so not just by increasing the exploitation of workers at home with increasingly crappier working conditions, but also by being accessories to the fact of mass murder abroad. There is only one solution to both problems. It is the total destruction of the capitalist system and the imperialist world order that has grown out of it. That’s why we keep on fighting the class war – the only war worth fighting for the future of humanity. The photograph is of a bombed Yemeni high school. 9. For an analysis of Trump’s and the US’ wider imperialist interests see “US Power and the New Course Towards War” in the forthcoming edition of Revolutionary Perspectives 12.